As this story seems to be going viral, I want to put on the brakes a little and see if perhaps we can supply some answers to some of the questions which seem to be popping up regarding this incident. First, Jindal spokesman Kyle Plotkin tells us that Alle Bautsch was not wearing a Palin pin. And neither was Joe Brown. So that’s an allegation which has been disputed. Second, as far as the Jindal administration is concerned they do not have evidence at this time that the attack on Bautsch and Brown was directly related to the protest. We have a report, as you’ll see below, that the attack was politically motivated, and we’re looking forward to full confirmation of that fact. But the two are not necessarily at odds; our understanding is that Bautsch and Brown remained at Brennan’s after the fundraiser was over and by the time they left there wasn’t much of a protest going on – so if we’ve given the impression that the attack occurred as a result of fundraiser attendees having to run a gauntlet of Democrats upon leaving the restaurant we’d like to correct that right now; that is not our understanding. Third, since the attack itself appears to have come from assailants who apparently either followed the victims (which we think is most reasonable, given that Brennan’s is located half a block from a police station) or happened upon them and decided to express displeasure with Republican politics in an unacceptably demonstrable fashion, a facet of this we’re actively looking into is the nature of the protest itself. 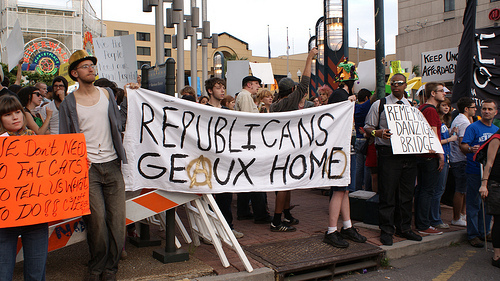 As we noted in the original post here, a group of self-described “anarchists” claim to have disrupted the event and there are snippets of information – or were – following the event in which people holding themselves out as protestors bragged about confrontations with evil Republicans they’d had on Friday. Of course, as of yesterday we’ve seen that chatter die off completely. There are two possible explanations for this – one might be that the disruptions and confrontations were greatly oversold and there’s nothing more which can be said about them, while the other might be that once the story of what happened to Allee Bautsch and Joe Brown became public those involved realized that the publicity surrounding that protest was going to be all bad from there on in. I personally find the latter a little more likely simply because of what happened to the victims, though this is in all likelihood a good example of how bad apples can spoil a bunch. Jeff Blanco’s video below of the protest shows it to be relatively peaceful, if a little obnoxious. Finally, the main question we seem to be getting here is “why is it this story took so long to break?” The conservative meme that if this has been Tea Partiers beating up a poor black kid or a transgendered lesbian without health insurance it would be immediate front page news is certainly one which isn’t injured by this sequence of events. But I don’t think that’s what’s going on here. The New Orleans Police Department hasn’t said Thing One about the attack, and it’s hard to get reportable information on something like this when the cops – who are the folks supposedly carrying the most reliable information – don’t provide anything. Also, since the victims have been laid up since the attack and haven’t released anything on it, the Times-Picayune and the local radio and TV stations would naturally have a tough time gathering anything on it. A double murder in the 7th Ward on Monday afternoon. With a police blotter that full, it really isn’t that much of a surprise that an attack which didn’t involve someone dying or gunplay wasn’t an immediate big story. Should what is being reported pan out, however, it’s likely the Brennan’s attack will have more legs than the others.